Having studied urban forestry in college, I figured I would caution against the most common mistakes and share some tips to properly establishing trees. Chances are the window has passed for the season on planting trees. But I hope use can be found by the readers in northern climates or those who like to crawl end of season nursery sales like I do. Otherwise I may re-post this in the fall and spring to align with tree planting seasons. Mulch as deep as you want at the site of the planting well ahead of planting time. If you plan to dig the holes with a shovel, you will be vastly assisted by the change this brings on in soil composition and elimination of turf. Don’t bury the stem too deep. If grafted, keep grafting mark above the soil or else the roots will send up stems of their variety negating the graft. Don’t use ANY mulch at the base of the trunk. Leave a void to keep the base of the tree dry but pile as much as you want on the outer areas of the root zone. See here for mulch sourcing tips. Never under any circumstances use dyed mulches. Avoid most bagged mulches as they usually come from conifers like hemlock or other cedars, spruces firs or pines. Conifers contain high amounts of substances that inhibit deciduous trees allowing conifers to form dominant stands in nature. 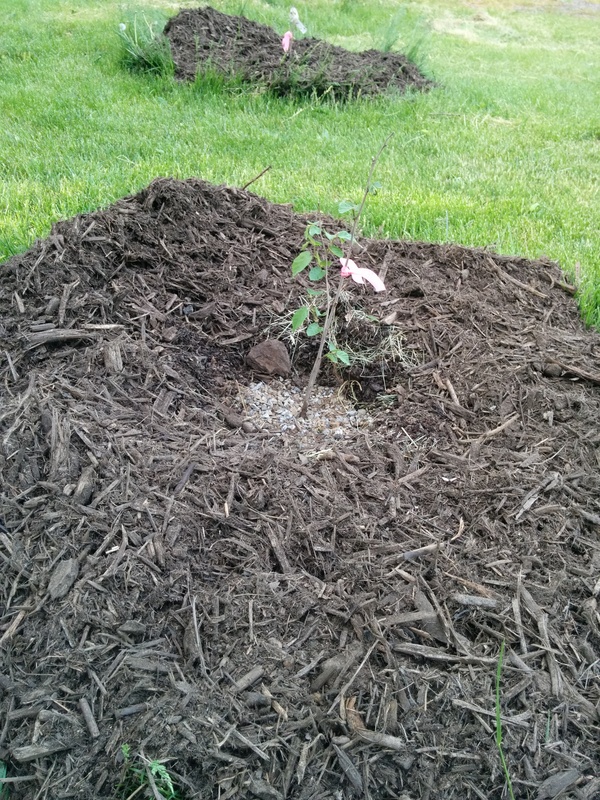 Follow up to point 3 above, use fine gravel extending from the base of the trunk to the mulch. The source that lays out this recommendation and justification states any gravel smaller than 3/8 will keep the wood dry and rot/disease-free. If possible, apply mulch or bury it at planting site well ahead of the actual planting. This will cultivate the fungi-dominant soil that trees require. Try to do this at least a year ahead of time, but don’t sweat it if you can’t. Don’t stake! Use very young trees so their stem can develop strength of their own through wind exposure. If you injured your leg and refused the doctors orders to work on recovering from crutches, your muscles would atrophy. Trees are similar. If you must stake, us a large, rigid loop that doesn’t actually touch the tree but rather float freely to catch a tree when it sways too much in any direction. At the very least, make sure any part of the staking system that touches the tree is designed for that purpose to prevent injuring or girdling which can be fatal. Succinctly, no exposed wire and no wire wrapped in garden hose! While contested in the arborist community don’t fertilize trees at the time of planting and don’t excessively water. Try and make a depression near the tree as a catch basin for water. Let the roots become established before adding extras. Fertilize from the top only! Let the soil microbes and invertebrates make the nutrients bioavailable to the tree like natural cycles in a forest. Don’t automatically pull any weeds! Plants with a taproot can help cycle nutrients are various depths in the soil. Others can provide a living mulch while not competing for the nutrients specific to woody plants like trees. If you really want to get carried away, in early spring spray every surface from root zone to trunk to the smallest buds with a microbe-encouraging liquid like compost tea or fish meal. This will give the beneficial microbes a boost at colonizing every crevice of the tree allowing them to outcompete potentially harmful and destructive microbes in turn leaving no entry points for more serious pests. This is especially important for fruit frees! Think biologically, not mechanically! Every fall, pretend you are Tom Sawyer and cover every bit of bark you can reach with a whitewash of interior paint and equal parts water. This helps prevent winter injury caused by pest (both bugs and microscopic types) from entering the woody tissues. Learn how to properly prune! Basically, prune only during the dormant season and prune branches outside of the branch collar (show below). The tree will naturally callous over the exposed wood in an effort to heal itself.